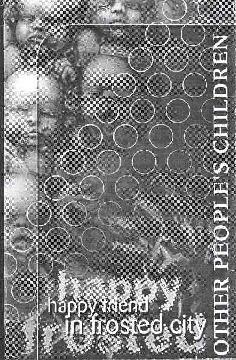 Other People's Children - "Happy Friend In Frosted City"
Other People's Children is a solo project by Australian based electronics musician Jason Sweeney. There is very little information at his web site but the discography indicates this is the most recent of several releases. The music is lo-fi electronics with the focus usually on Sweeny's songs, though he also does a good job with his limited equipment at creating interesting atmospherics. For example, "Electrolyte Lamp" consists of lo-fi drifting and pulsating ambient waves. Drones and melody coexist in a simplistic netherworld of electro sounds. But then there are songs with a 60's pop edge like "Design Department", "Suicide Common", and "Electricity, Your Friend". I especially liked "Design Department" for its 60's bop-ba'dop-ba'-ba pop backed by lo-fi electronics. And "Electricity, Your Friend" offered some freaky electro dance-pop. "Bernard Sumner" and "Sea Vacation" reminded me of Eno's 70's 'songs'. Gratitude Failure" has a dark gothic atmosphere. And "June Telephone" has whimsical bubbling electro pop noodlings with melody buried in them, kind of like Bill Nelson's early post-Be Bop Deluxe electro experimentations. Like most Best Kept Secrets releases, you have to listen closely to appreciate that behind these simple tunes are some well written songs. Fans of lo-fi electro pop should dig this. You can visit Other People's Children at their web site. Contact via snail mail c/o Other People's Children; 151 Anderson Street; Yarraville, VIC; 3013; Australia. Happy Friend In Frosted City is distributed by Best Kept Secret. You can visit their web site.